Dr. Garry’s homework for you for next week – watch these two videos: Video 1 and Video 2. Don’t ignore your tech, consider choosing different friends. More reasons why you might enjoy checking out the NosillaCast community over at podfeet.com/googleplus. Inspire your young ones this summer with littleBits from littlebits.cc. I walk you through the absolute comedy of what you have to do to get music on the Apple Watch – about as complicated as it used to be to use a Blackberry. In Chit Chat Across the Pond Bart takes us through Taming the Terminal Part 35 of n, HTTP commands. Earlier this week Dr. Maryanne Garry, the professor from New Zealand who helped us doubt all of our childhood memories in a past episode of Chit Chat Across the Pond came to visit again and we did another recording. It should air next Sunday on the 12th, and in the recording you’ll hear her refer to some homework you’re supposed to do before you listen. In this next interview she’s going to make you doubt your own perception even more, this time in understanding the difference between vision and attention. I’m putting links in the show notes to two videos she wants you to watch. You may have seen one or both of them before but it will help understand what she’s saying to rewatch them. At the end of the show I mention how fun Google Plus is but I figure at lest 50% of you guys shut the show off as soon as you hear the end of Chit Chat Across the Pond. I’m am SUCH a fan of our Google Plus Community because there’s just the right amount of activity. It’s not too chatty but just chatty enough to keep you coming back. The people in there are super smart (I mean, of course they are if they’re NosillaCastaways, right?) and answer questions better than me. This week I posted a problem I was having turning off hidden files in OSX. Four people responded with different solutions in less than a day! George from Tulsa and Jim Sewell both posted links to some cool tech deals, inspiring me to create a special category to identify posts as deals. Allister posted a link to a blog post he’s written asking us to encourage a certain vendor to include a feature he wants. Steve is an avid poster of articles around the web of interest to tech fanatics so he posted an article about force touch maybe coming to the next iPhone. And of course I post my blog posts there as soon as they go up so you can get a head start on telling my how wrong I am before I talk about it on the podcast. 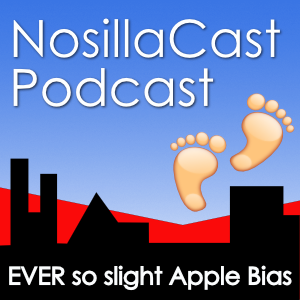 If you haven’t joined the NosillaCast G+ community yet, or if you never tapped the little bell to get notifications when someone posts so you forgot about it, go over to podfeet.com/googleplus and check it out! This week I’ve been working on a cool method to regain some functionality that we lost in the Photos app from Aperture. Don’t get all excited, I didn’t figure out how to make brushes appear in the edit mode or anything like that, it has to do with the file naming conventions. I’m pretty close to done with it but I”m going to save it till next week when I have more time to explain it. I wasn’t sure I had it working but in one of my tests this week, I decided to open Clarify and start documenting while I worked on it. One of the joys of Clarify is that you can take screenshots and later on easily replace them if something changes. There’s a little circular arrow at the bottom of every image just inviting you to retake that shot. When I work like this I usually don’t put annotations in or even write up any text to go with each step. It’s a great way to stay focused on doing something and yet grab the shots while you’re going so you don’t have to go all the way through it again later. If it works, great, I can go in and drop in sequence numbers, arrows to draw attention to things and write up a good explanation of the meaning and logic of each step. If it doesn’t work, I can just trash the whole thing and I haven’t lost a ton of time invested in documentation. If you’re trying to figure something out and don’t want to litter your desktop with gobs of screenshots with useless names, consider using Clarify to gather the shots into a logical order as you’re working. I bet it will help you and make you happier. Maybe thinner and with more hair too, but the developers don’t promise that. Check out Clarify for Mac and Windows at clarify-it.com. To each their own. I’ve found the MacPorts is actually fine going between recent OSes. It used to give me problems back when Apple did big OS updates, but since Apple moved to a yearly cycle, Ports has just kept working for me. I don’t find Ports intrusive, because it puts all it’s stuff into /opt/local, islanded away from all the standard stuff. It does put itself first in your path by default, which can make it seem intrusive, but that can easily be fixed if it causes problems. I think I have it at the end of my path on some machines so the system versions of Perl would be first in my path. I like that MacPorts is system-wide, but that same feature could be a minus for many people! I’ve used Brew too, and it works fine. It does stuff in your local account, and not at a system level, so on multi-user machines it can be annoying for that reason. If you want stuff installed at a system level, then I would recommend MacPorts, if you want stuff at a user-level, then Brew is your best bet. One thing I have found is that Brew complains a lot if you use it on a system with MacPorts installed. So far all the complaining has been just hot air for me, I have the two running side-by-side on one of my Macs and everything is working fine, despite Brew warning me that it doesn’t like sharing with MacPorts.